Sailability Tin Can Bay Inc were recently the recipients of a grant from the Gambling Community Benefit Fund. This grant allowed us to do several things including First Aid course for our volunteers, new PFD vests for the use of our disabled clients, a replacement trailer for our Safety Boat that is on the water at all times when we are sailing, plus a new set of sails for our Access 303 sailing dinghies. We now have 6 sets of brightly coloured sails to match the boats. As our original sails had logos, courtesy of several local groups including Lions and Rotary for example, we have placed those logos back onto the sails at no cost to the organisations. We of course would be very open to receiving a donation from them, but we felt as they donated once, maybe we should do it this time. 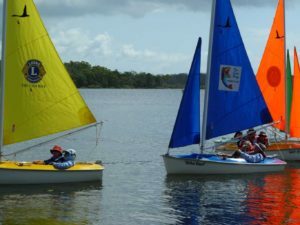 Sailability TCB Inc. sees around 25 to 30 folk in various degrees of disability each Friday morning. Our fully trained skippers take them for a 30 minute sail in our two man yachts. We are always happy to see new clients as well as volunteers. Contact our Secretary Raewyn Oliver on 0412 995 512 for further information.